The district has the largest population base outside the Minneapolis/St. Paul metro area. The districts southern boundary is located adjacent to the metro area and is rapidly becoming part of the greater urbanized area, with a strong commuter demand currently served by highways, buses and park-and-ride lots. The central portion of the district wraps around the St. Cloud metropolitan area, which is one of Minnesotas fastest growing communities. District 3, which encompasses much of central Minnesota, has two full service offices-- the district headquarters is located in Baxter and a second office in St. Cloud. Twenty truck stations, staffed with experienced transportation specialists, are strategically located throughout the district. This presence helps to provide efficient highway construction and maintenance, which benefits all customers, internal and external. Approximately 380 dedicated employees are skilled in engineering, snow and ice control, traffic, land acquisition, business planning and much more. District 3 is staffed to be a competitive organization. Each person plays an important role in the safety and efficiency of Minnesotas transportation system. District 3 brochure: Overview of the district, what we support and contacts. Local Plan & Development Process: A guide designed to assist in understanding the process and requirements for involving District 3 in the review of local plats and development proposals. 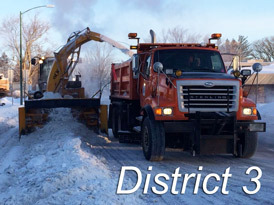 District 3 roads: Map of the roads the district maintains. Our district has a few boundaries depending upon the services. The main boundaries are funding ATP-3 based (twelve counties) and maintenance based (extends outwardly). We invite you to view recent news, real-time traffic, future and current construction projects in Central Minnesota. Want information about a different district? Use this city listing or click on a region below for more information.